Yes, this is my business and I live in St Pete. We are a small local family owned business. APL Lawn Spraying looks like a big company because of my expertise, organizational skills and great tech savvy. But, we’re just a local family business – a really good local family business. I am your local agronomist. I have been working in Pinellas County since 1995 researching, developing and testing the best management practices for growing St Augustine turf. I discovered the right materials, equipment and techniques required to grow and maintain a healthy beautiful lawn in Pinellas County. I'm the only agronomist in the county, I know of, and certainly the only one who has studied St Augustine turf for over 20 years. What is an agronomist? Well, people have doctors, animals have veterinarians and plants have agronomists. Agronomists find the best way to grow plants and keep them healthy. I graduated from Va Tech ’79 in agronomy specializing in turf ecology. Turf is my thing and Pinellas is where I know the most! Since 1980, I have been working in the green industry, mostly with golf courses, resorts and large communities. I’ve worked as a Golf Course Superintendent of Fripp Island Resort, agronomist for Seaside, FL and the spray tech for Vinoy Golf Course. I have been a certified arborist, landscape and irrigation contractor and adjunct professor for Environmental Horticulture (SPC) in Pinellas County. To me, there are few things about Pinellas lawns and landscapes that remain a mystery. Rick Orr, owner operator, graduated in 1979 from Va Tech with a degree in Agronomy/Turf Ecology. Since 1985, Rick Orr has been a Florida certified Pest Control Operator and a certified Commercial Fertilizer Applicator. APL Lawn Spraying is licensed by the State of Florida for Lawn and Ornamental Pest Control and Commercial Fertilizer Applications. APL Lawn Spraying is insured for liability and workers comp. From the Pink Streets to Tarpon, we service only Pinellas County. APL Lawn Spraying, Inc. was formed in 2001 as a partnership between two local family owned lawn spraying companies and continues today as local family owned lawn spraying service provider. No Contract Required and Only 6 regular scheduled services per year to fertilize, control bugs and weeds. The philosophy is simple: Encourage the turf and discourage everything else. 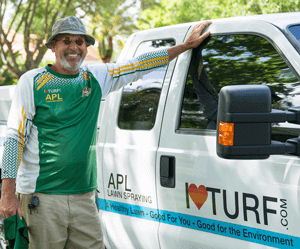 *APL Lawn Spraying and ILoveturf.com are registered trademarks of A Promised Land Lawn Spraying, Inc - a Florida Corporation. Click here to request your free lawn evaluation and service quote online.